ATLANTA – OK, let’s take a break from all the injury talk and bullpen question marks for a day… or at least until J.C. Romero and Scott Eyre complete their bullpen sessions on Saturday. And then there is the issue of Carlos Ruiz’s sprained wrist suffered on a play at the plate during the second inning on Friday night. Oh, and J.A. Happ came out of the game after three innings because Jimmy Rollins and Chase Utley saw him grimace after a play and alerted Charlie Manuel. Needless to say, Happ wasn’t too pleased about coming out of the game. But what about Ryan Howard? After all, for the second straight game he got drilled by a pitch on the same exact spot on the right forearm. “Probably pretty high and I beat them,” Howard laughed. Ruiz’s injury as well as the injuries to the relief pitchers is of the most concern to Manuel, who believes Happ will take the ball in his next start. As far as Howard goes, well, those two shots to the forearm should have felt like nothing more than a bee sting to the big fella. Make that, “The Big Piece,” as Manuel calls him. It’s more like the other way around. Howard has been the one hurting the baseball these days. Actually, make that a lot of days since it appears as if The Big Piece is well on his way to becoming the most prolific slugger in team history. Friday night’s pair of homers made Howard the first Phillie ever to bash 40 in four different seasons. And not only did Howard hit his 40<sup>th</sup> homer for the fourth season, but he did it with panache. For Howard it’s 40 homers <em>AND</em> 120 RBIs in four straight seasons. 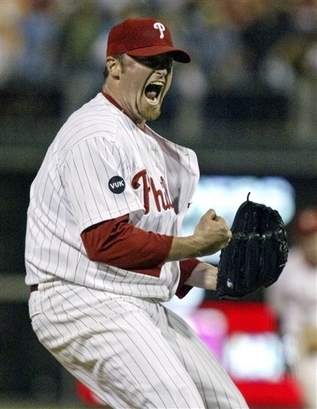 Not only hasn’t a Phillie ever pulled off such a feat, but very few Major Leaguers have accomplished it. In fact, Howard became just the fourth member of the club on Friday night at Turner Field. The Big Piece joins Babe Ruth, Ken Griffey Jr. and Sammy Sosa as the only sluggers in Major League Baseball history to slug 40 homers and drive in at least 120 RBIs in four straight seasons. That’s it. But get this, only one other hitter accomplished the 40-120 trick in more than four straight seasons and that was The Sultan of Swat himself. The Babe did it in seven straight. Here’s the amazing stat for Howard – in 717 career games, he has 620 RBIs. That comes to an average of 140 RBIs per 162 games, which is the career high of Hall of Famers Harmon Killebrew and Jim Rice. There’s more to consider, too. Howard doesn’t turn 30 until November 19, he never drove in more than 149 RBIs in a season which points to his uncanny consistency. However, the numbers that really stand out are the splits from August, September (and October) from the Big Piece. Check this out: 91 of Howard’s 217 career homers have come in the last two months of the season. Additionally, 254 of his 620 career RBIs have come in the last months, too. That means Howard feasts on pitching late in the season when the games take on added significance. Enjoy it folks… sluggers like this Howard kid don’t come around that often. Jamie Moyer pitches for the Phillies tonight, which is kind of a big deal. Sure, he’s going for career win No. 250, but more than that, he really, really, really needs to pitch well. You know, for a change. Moyer hasn’t been very good this season. The 8.15 ERA and opponents’ .344 batting average against him is part of it, but most telling are the last three starts the 46-year-old lefty has turned in during May. In those three starts Moyer has given up 22 hits, 19 runs, six homers and seven walks in just 12 1/3 innings. Yet Moyer isn’t in jeopardy of being moved out of the Phillies’ rotation. That already happened yesterday when Chan Ho Park was shifted to the bullpen and lefty J.A. Happ slid into the vacant spot, and Park hasn’t been nearly as bad as Moyer. But Moyer wasn’t 46 then and he hadn’t just finished pitching deep into October for the first time ever. He also hadn’t just signed a two-year deal in which he held out for more money. Yes, Moyer is getting $13 million in base salary with incentives that could take the worth of the deal to $20 million. He also will get $250,000 each for 150, 160, 170, 180 and 190 innings pitched. In 2010 the base salary can reach $4.5 million and he will receive $250,000 each for 150 innings and 23 starts, and $500,000 each for 160, 170, 180 and 190 innings, and 25, 27, 29 and 31 starts. Moreover, Moyer has a no-trade clause in which he can block deals to six teams, but no more than four in a specific league. There's no such clause for what happens if Moyer gets moved out of the rotation or pitches poorly. Still, not a bad deal for a 46-year-old lefty with a fastball that can’t break glass and a three-game stretch in which opponents are hitting .400 off him with an on-base percentage near .500. Moyer’s age was “a concern” as general manager Ruben Amaro Jr. admitted when announcing the signing, but he said the team wanted to show a “commitment” to the veteran pitcher. Make that a veteran pitcher with no versatility, a two-year deal and a no-trade clause. Early September for the Mets? According to reports, the battle for the fifth-starting position in the Phillies rotation has been pretty tight. That's a good thing considering there really isn't anything else going on at Camp WFC in Clearwater, Fla. this spring. Sure, John Mayberry Jr. is making a strong case to earn a spot on the 25-man roster, and the Phillies might need someone to replace Pedro Feliz and/or Chase Utley if the injuries aren't healed come Opening Night. But for the most part the only bit of intrigue comes from a bunch of guys hoping to get into about 32 games this season. Veteran Chan Ho Park and lefty J.A. Happ are making strong cases to wrest the spot away from de facto leader Kyle Kendrick. In fact, no member of the trio vying for the only available opening in the starting rotation has allowed more than two runs all spring. Better yet, neither Park, Happ nor Kendrick has issued a walk all spring, while the lefty has eight strikeouts in eight innings pitched, while Park has five whiffs in seven innings pitched. Kendrick has appeared in just one spring game so far, allowing a run and four hits in 2 2/3 innings. Dark horse candidate Carlos Carrasco has pitched five innings in two outings, but seems headed to Triple-A to start the season. But while the battle for last starting spot for the Phillies' rotation has been a veritable battle royale, it has been the same on the other side of Florida where the New York Mets train. 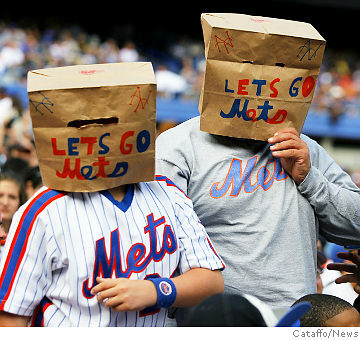 Like the Phillies, the Mets also have an open competition for one spot in the rotation. And like the Phillies, three pitchers - Livan Hernandez, Tim Redding and ex-Phillie Freddy Garcia - are fighting it out in Grapefruit League action. But that's where the comparison ends. On the Gulf Coast of Florida, the Phillies' trio has been pitching well and will give manager Charlie Manuel a few sleepless nights trying to figure out who the man will be. But on the Atlantic Coast, the Mets' battle hasn't been nearly as intense. According to a story in The New York Times, the notion that the Mets could go outside of camp and sign a free agent (Pedro Martinez?) to take that spot is fair for speculation. Quite telling is that despite the fact that Garcia has an ERA well over 20 runs per nine innings, Redding has been the hardest hit thus far. In an exhibition against the University of Michigan, Redding allowed five hits and five runs, including back-to-back homers, before being pulled with one out in the third inning. Just think how rough it would have been if he was facing Ohio State. Now to make matters worse, ace lefty Johan Santana has dealt with a little arm trouble through the early part of the spring. Man, it seems as if it's September already for the Mets. LOS ANGELES – Having some trouble with the wireless connection again out here, which is kind of a pain, but oh well. My trouble getting online is nothing like the Phillies’ problems in attempting to figure out Hiroki Kuroda. In two previous outings against the Phillies, the 33-year-old rookie from Japan pitched a pair of two-hitters. So far tonight in Game 3, Kuroda is again pitching a two-hitter. After Pedro Feliz’s two-out RBI single in the second inning, Kuroda has retired 10 in a row with three strikeouts. I wish there were something more to add, but the Phillies just can’t figure out Kuroda. Forget the third time being the charm… unless the Phillies stage some sort of wild rally, the Dodgers look like they’re going to get back in the series. Meanwhile, the fans here at Dodger Stadium are having a good time doing the wave and batting around beach balls. Sometimes they even watch the game. That’s where they’d see everything going the Dodgers’ way. During the sixth, Kuroda sat the Phillies down in order again to push his string to 13 straight retired hitters. 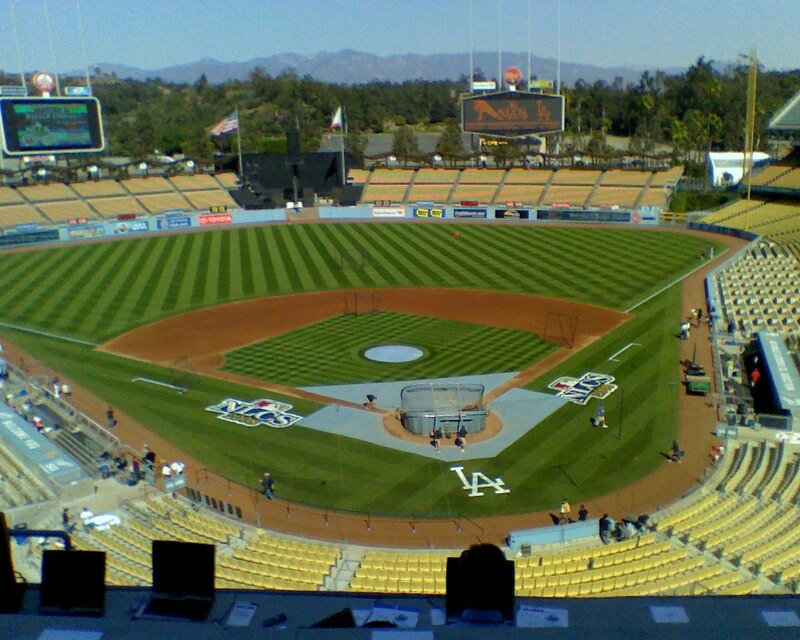 Between the top and bottom of the sixth, they showed a montage of Fernando Valenzuela highlights. The fans went nuts. On another note, I saw Fernando in the press box before the game, but he didn’t seem to remember our conversation from the other day. Scott Eyre came on in the sixth for Happ. Who knows… maybe Happ will start the next time Moyer’s spot in the rotation comes around. Greeting from friendly Citizens Bank Park where we are back in the same spot for Game 1 of the NLDS just the way we were last year. Better yet, just so we don’t confuse anyone the live, in-progress updates will flow like water from a faucet. Nevertheless, there was plenty of intrigue here at the Park this morning. For one, manager Charlie Manuel told us he made out two different lineups for the opening game. In one, Pat Burrell was in his normal spot in the order and playing left field just like always. But in another, Jayson Werth shifted from right field to left and veteran Matt Stairs was slated to play right. That contingency was made just in case Burrell’s aching back did not hold up following a strain he suffered during batting practice yesterday. However, after he took his hacks this afternoon, Burrell shot Manuel the thumbs up and declared himself ready to go. Besides, trainer Scott Sheridan said Burrell was feeling “significantly better” last night and showed up at the park at 8 a.m. this morning for treatment. So far everything appears to be OK for Burrell and the Phillies. Meanwhile, the Phillies will go with 11 pitchers during the first round which means reliever Rudy Seanez will not be on the NLDS roster. Instead, the Phillies will have outfielder So Taguchi off the bench and rookie lefty J.A. Happ as the long man. This morning Manuel said the roster decisions were difficult. “That was the toughest decision we had to make. Seanez played a big part in our season, especially early and all the way up to July,” Manuel said. Finally, Shane Victorino’s shin is fine, too. Check back closer to game time. I’m going to fight the crowd and find something to eat in the dining room. Kyle Kendrick - Sunday would be his normal turn in the rotation and the young righty has missed just one start (later made up) all year long. However, Kendrick has been downright dreadful in his last six starts. Though he has 11 wins in 29 starts, Kendrick is 1-4 with a 11.35 ERA since Aug. 11. Numbers like that make it difficult for Manuel to be confident with Kendrick on the mound. J.A. Happ - The lefty has pitched well in two starts this season, but sending Happ to the mound in the middle of the pennant race for just his fourth big league start seems like a big risk. 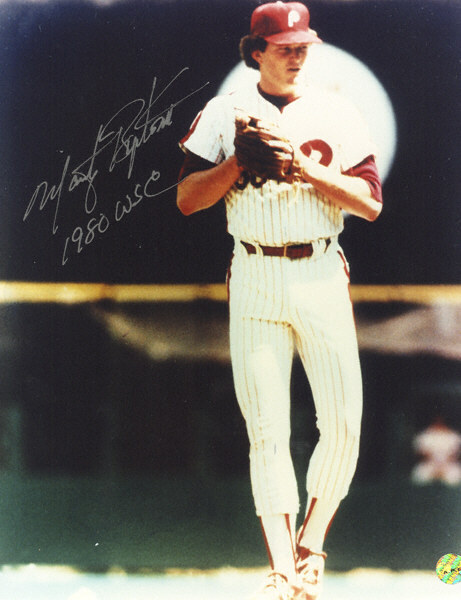 Happ will have a solid Major League career, but he's not going to be Marty Bystrom for the Phils this year. Adam Eaton - Yeah, never mind. Brett Myers - The opening day starter has worked on short rest just once in his career, however, last season he pitched nearly every day down the stretch out of the bullpen. Is there a difference? Yeah, most definitely. Nevertheless, the pressure is something Myers thrives on. If the Phillies take the first three games of the series, look for Myers to go after the sweep on Sunday. Expect a hint about a decision on Friday afternoon. *** The Phillies added an important insurance run during the eighth inning of Thursday's win over the Brewers with a suicide squeeze from runner Shane Victorino and bunter, Carlos Ruiz. With one out in the inning, Manuel said he waited for the right chance to flash the sign, which came on a 2-1 pitch. Ruiz laid it down perfectly to allow Victorino to score with ease. "I guess I'm finally acting like a National League manager," Manuel joked. "I figured it was time to show them I knew the squeeze sign." The inspiration to give Ruiz the sign came from the catcher himself, Manuel said. "I heard Ruiz when he went up the steps. He turned around and asked, ‘What's the squeeze sign?' That kind of told me ... he wants to squeeze. Seriously, that's the truth. I figured I might as well let him squeeze." Good idea. *** Elsewhere, Bob Ford chronicled the rise of Mr. September, Ryan Howard. The big fella added to his league-leading home run and RBI totals in the win over the Brewers and just might have inserted himself into the MVP discussion again. Fonzie, Richie Cunningham, Joanie, Chachi, Laverne, Shirley, Jeffrey Dahmer, Liberace, Heather Graham and Todd Zolecki all come from Milwaukee. But only Todd wrote about the Brewers' September swoon and Jamie Moyer's top-shelf effort on short rest. Coming up: Floyd Landis preparing for a comeback? Plus, regular-season awards.